The review entitled Les Lèvres nues by surrealist artist Marcel Mariën from Brussels published Guy Debord’s first critical essays about the city. In 1955, he published his Introduction to a critique of urban geography in which he defined the concept of psychogeography and more particularly its effects. He emphasised that the “consciously arranged or undeveloped geographical environment” has a direct impact on “the affective behaviour of individuals”. Its effects may offer opportunities to rethink urban planning, to make the city an “integral and exciting” setting/playground that “continuously depreciates current entertainment initiatives”. 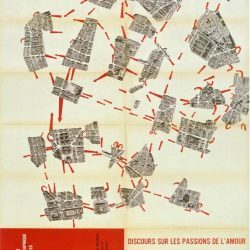 In 1956, Guy Debord had an article published in the Belgian review La théorie de la dérive ; the dérive (drifting) definitely being “the mode of expression most adapted to psychogeography”. The drifting or passage, in fact, is neither a voyage nor a stroll. There is no starting point or a arrival point, no steps to take. The dérive is a rapid passage “a technique of rapid passage in various atmospheres”. It can last from three hours to three months. Over a long period of time, one dérive leads to another. In a group there are as many dérives as there are individuals. A situationist dérive is created according to the emotional state of the moment, in relation to the objects and bodies present and the situations encountered. In short, it is open to the unexpected. The dérive, let’s reiterate, is not just in “posh” districts (bourgeois), business or tourist areas but in neighbourhoods that have few visitors, on the periphery of the city, in districts under construction or run down areas. The dérive has no boundaries, no imposed limits. Making maps also serves this purpose. More often than not, when you have two topographical representations, a completely arbitrary third appears. This addition “helps to shed light on the fact that certain displacements have the feature of perfect insubordination to usual solicitations”. It is understandable: situationists suggest going against the flow of dominant urbanism that is outside the emotional sensitivity of men. In La déclaration d’Amsterdam by Debord and Constant, unitary urbanism is advocated as the new artistic attitude that is totally undisciplined, impractical and completely organic in nature. The visionary architecture of New Babylon 1956-1974 by Constant is paradigmatic. Multiple interior spaces extend to infinity; inhabitants moving from site to site within a network of “sectors”, and reinstating each aspect of the environment as they wish. In other words, situationists have established in their own way that promotors of our cities are trying “to control everything and leave as little room as possible for uncertainty. Chance is then some kind of balance: one we can’t predict but that we try to reduce constantly (…).”. And chance is probability, not the unexpected. Imagine a game of dice. By throwing dice randomly, we are at least sure that it will land on one of the six sides, we just don’t know which one. We can then imagine scenarios, keep throwing the dice so it lands on the side required and so on. “The action of chance is naturally conservative and tends, in a new framework, to reduce everything to the alternation of a limited number of variants and habit,” writes Debord in La théorie de la dérive. It would be preferable not to be dominated by chance and to leave more room for serendipity. Serendipity is the careful search of “an unexpected, aberrant and capital data”, that leads to new understanding. Conducting research in this sense is to accept the unexpected when it arises and to take advantage of it to advance, modify, change the course of things. The process of serendipity is close to innovation and/or creation. To innovate and create, we need an unpredictable element, something that turns everything on its head when we least expect it. Thus, the dérive of situationists could not be considered an art of serendipity, should such a thing exists? The permanent revolution desired by situationists and primarily Guy Debord did not succeed completely. That said, isn’t a person drifting not a “figure of urban resistance” ? Sure, resistance is passive but in the words of Walter Benjamin, it is the “very essence of the brave”. Since Baudelaire, Benjamin, Debord, the precedence of the stroller invites us to reconsider the power of wandering; it is a city-dweller’s ability to interact with his environment and then to redefine it. In this sense, the dérive and its relatives cannot die. And the recent history of the arts demonstrates this point. Generations of artists (like Italian group Stalker, who created an urban art lab in 1994, and the Urban Tapestries London collective who suggested a reform of the relationship with the urban landscape by means of a mobile app since 2003) have developed things in their own way along unexpected paths and crossroads. They experimented, and are still experimenting, with the urban space beyond its controlled happenstances. Corinne Melin is a doctor of aesthetics and art sciences at the University Paris 8. She is also an associate member of the Laboratoire du Geste run by Mélanie Perrier and Barbara Formis. She is particularly interested in the common ground shared by different disciplines. Her publications include Allan Kaprow, une traversée, in December 2014, Fragments pour Isidore Isou, artbook magazine edition, December 2017. « Les Lèvres nues, 1954-1958 », published by Allia, Paris, Nov. 1995. 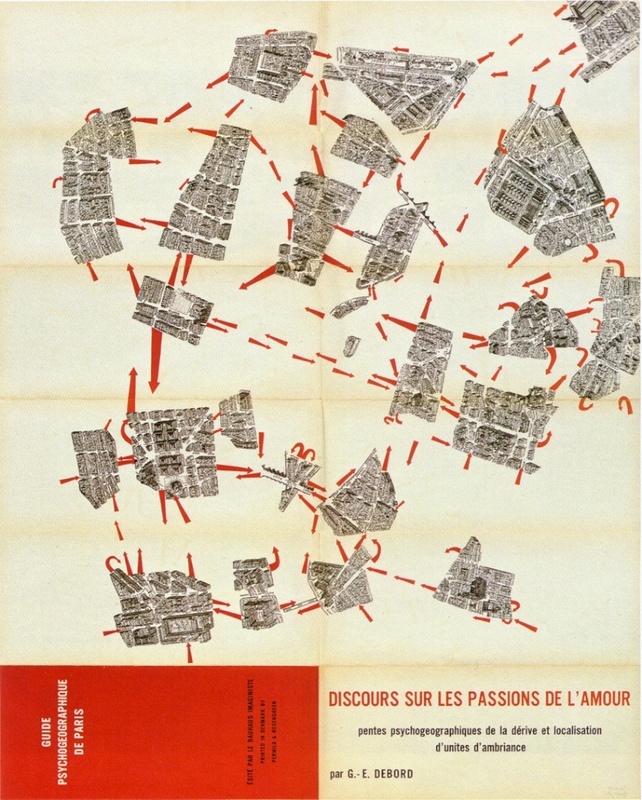 Les lèvres nues, n° 9, Brussels, 1956, Debord, « La théorie de la dérive ». 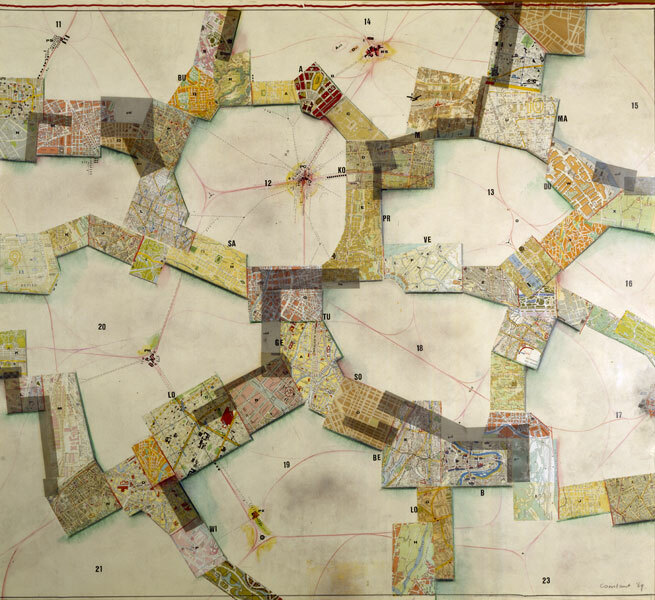 Maps are a familiar means of expression of psychogeography and spearhead a dérive. Debord’s essay « La théorie de la dérive » was republished in 1958 in issue 2 of International Situationist. François Ascher, Preface of the book De la sérendipité by P. van Andel & D Bourcier, 2009 in preparation for his death and published as a tribute in the proceeding of the conference, La sérendipité dans les sciences, les arts et la décision under the direction of Pek Van ANDEL and Danièle BOURCIER, 20-30 July 2009, Cerisy Cultural Centre, p.22. Capitales de la modernité, Walter Benjamin et la ville under the direction of Philippe Simay, published by L’éclat, Paris, 2005. Régine Robin L’écriture flâneuse, p 40. Walter Benjamin, Paris capitale du XIXè siècle, published by Cerf, Paris, 1985, p 11-46.